For years I've been flipping past the mosaic pattern sections of my Barbara Walker books. Once, in the early '90s I made a little practice swatch to try the technique, but what I really wanted to do then was Fair Isle on #3 needles. After seeing a few of the bags, baskets, and bowls my friend Wendy Wonnacott has created with mosaic stitches, I've gained a new appreciation for the technique. 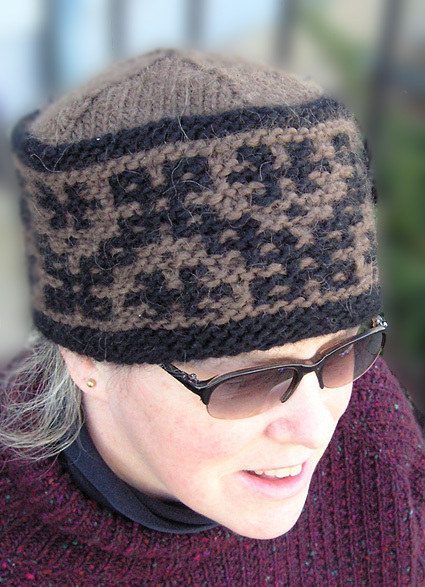 Crosspatch is a warm winter hat, worked in the round. 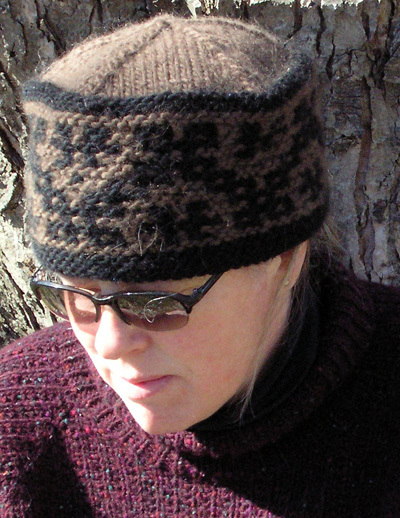 It features a garter-based mosaic stitch band and is topped by a slightly rounded crown worked in stockinette stitch. The suggested yarn is very warm without a hint of itch. To knit a smaller version, use smaller needles to tighten up gauge. For child sizes, follow the pattern with worsted weight yarn and size 6 or 7 needles. When working this mosaic pattern, you will alternate colors every 2 rows. You will only be using one color at a time. 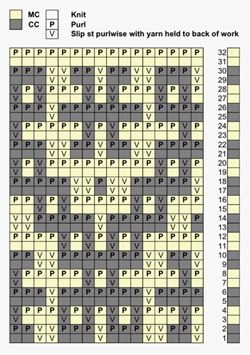 On odd-numbered rows, the stitches on the chart that are in the working color for that row are knit, those in the opposite color (marked with a "V") are slipped purlwise. On the subsequent even-numbered rows, the stitches that were knit in the preceding row are purled, and the slipped stitches are slipped again. Read all chart rows from right to left. The bar at the right of the chart indicates the working color for each row. Always hold the yarn to the wrong side of work when slipping stitches. When beginning a new round, bring the new color up from under the old color, so that the yarns will twist around each other. This will prevent small holes from forming at the ends of the rounds. Using CC and circular needle, loosely CO 80 sts. Place marker and join to begin working in the round, being careful not to twist. Work 4 rounds in garter stitch. Work 2 more rounds in garter stitch using MC. Work Rounds 1-32 of Mosaic Chart. Using CC, k 1 round. Using CC, p 2 rounds. Break CC, continue working with MC only. Note: When working decrease rounds which follow, switch to double-point needles when necessary. Decrease Round 1: K7, [S2KP, k13] 4 times, S2KP, k6. 70 sts. Decrease Round 2: K6, [S2KP, k11] 4 times, S2KP, k5. 60 sts. Decrease Round 3: K5, [S2KP, k9] 4 times, S2KP, k4. 50 sts. Decrease Round 4: K4, [S2KP, k7] 4 times, S2KP, k3. 40 sts. Decrease Round 5: K3, [S2KP, k5] 4 times, S2KP, k2. 30 sts. Decrease Round 6: K2, [S2KP, k3] 4 times, S2KP, k1. 20 sts. Decrease Round 7: [K1, S2KP] 5 times. 10 sts. Decrease Round 8: [K2tog] 5 times. 5 sts. Dampen hat. Place over a straight-sided bowl with the same approximate circumference as your head. You may want to place a small folded towel or napkin in crown to help hold rounded shape. Allow to dry completely. 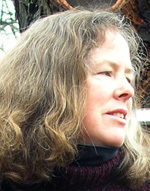 Elizabeth learned to knit as a child, but really became a knitter in her late 20s. Her patterns have appeared in Knitty and are available at The Garter Belt thegarterbelt.com. She blogs about her life with too much yarn here.